On Wednesday, February 15, 2006, a group of war resisters began a 34 day liquids-only fast in Washington, DC. The fast is sponsored by the Voices for Creative Nonviolence (VCNV) — a nonviolent action group made up of regular citizens who are fed up with the direction of the US government, especially as regards its foreign policy. The name that VCNV has given the campaign of which this fast is part is the Winter of Our Discontent. One of the fast participants is a man named Mike Ferner. I first heard of Mike when he traveled to Iraq in the winter of 2003 just before the US/UK invasion in March of that year. Mike is a Vietnam vet who served as a Navy Corpsman and then received an honorable discharge from the service as a conscientious objector. He is also a union organizer, member of Veterans for Peace, and served on the Toledo, Ohio city council. His book on his trips to Iraq (he went there again in 2004) is titled Inside the Red Zone: A Veteran for Peace Reports from Iraq, and is due out in August 2006. I had maintained a rather loose email contact with Mike over the past several months and decided to ask him a couple questions when I heard he was participating in this fast. The email “conversation” follows. Ron: Hi Mike, I heard that you were participating in the 34-day fast to protest the war in Iraq and thought I would check in with you. What made you decide to participate? Furthermore, since the administration is unlikely to be affected, whose conscience do you hope to stir with this action? Mike: I decided to participate because I needed to do something more to up the ante against the war. If you go to this page and watch the video featuring Jackson Browne singing “Lives in the Balance,” you’ll get as good an idea as I can give you why we need to do more for peace. There ARE lives in the balance and we in this country are all complicit in the suffering our government is causing. I agree with you that our fast/vigil/sit-ins won’t affect the criminals waging the war. We certainly want to call people’s attention to the crimes they are committing, but we know we won’t change their behavior by our small presence in Washington over the next month. It will change their behavior (and hopefully impeach and imprison them), however, if every person in the U.S. who opposes this war stops and thinks for a moment about what they can do to up the ante. Those are the people whose hearts we need to reach. We can all do more — every one of us — no matter what our job or station in life. And if every person mad as hell that this war continues thinks about what more they can do for peace, it will indeed make a difference . . . and more than just “make a difference” in some abstract way. It will throw a wrench into the gears of the war machine and grind it to a halt. This we can do, if every person of good conscience decides they have to do more than they thought they could do. Ron: You have a book scheduled to be published in late summer 2006. What is it about and when did you write it? Mike: We just settled on a title, Inside the Red Zone: A Veteran for Peace Reports from Iraq. It’s about my trips to Iraq and the people I met. People in the peace movement, Iraqis, G.I.s, and journalists. My first trip was just prior to the U.S. invasion when I went with Voices in the Wilderness for a month. The second trip was for two months in early 2004 when I went specifically to report and write. I wasn’t thinking at the time of writing a book, actually, but the more I worked at the stories, the more I realized I had experienced something that needed to be told. Ron: From your involvement in Voices for Creative Nonviolence, it seems apparent that you believe in the power of nonviolent direct action as practiced and preached by Martin Luther King, Jr. What experiences in your life led you to this commitment? Mike: First off, I don’t consider myself a pacifist . . . yet, anyway. Even though I’m learning more about Gandhi and King and nonviolent principles and I’m getting closer to being a pacifist the older I get, I can still see why people will resort to violence if they’re oppressed long enough. What has lead me to a life of activism was, initially, being a hospital corpsman during the Viet Nam war and taking care of the young men who came back in pieces from that conflict. Few things will turn you against war quicker than that kind of work. Then, through life I realized that the Viet Nam war wasn’t the only injustice, simply the first one I had experienced directly. I got involved in the environmental movement and the labor movement over the years. So social change has been the constant theme in my life since I got out of the Navy. Ron: What do you think lies ahead for the people of Iraq? Mike: While the U.S. continues to occupy it, nothing but violence and suffering. I believe that every political institution created in Iraq since the invasion will be seen as tainted by the invader, and as such, stands a good chance of being torn down once we are finally gone. That is not a pleasant picture to imagine, but it will happen whenever we leave. And until then, the violence and suffering will continue because our presence is fueling the resistance. Withdraw that fuel and the fire will subside. Who knows what will follow, but whatever it is, it will happen when (not if) we leave. Then, the peace movement’s mettle in the U.S. will be put to the test — to see if we can force our government to make amends for what we’ve done to the extent that is possible. Ron: How about the people of Iran? Mike: Our government leaders will seal the case for their insanity diagnosis if they take military action against Iran. If they do so, however, it won’t be anything like the Iraq war. Iran has got military capabilities far in excess of Iraq’s. They have missile systems that will inflict terrible damage and casualties to U.S. ships and ground forces in the region. Beyond that, of course, violent reprisals will become the order of the day, and we will have succeeded in making the world considerably more unbalanced and frightening. Ron: The people of the US? Mike: That’s a good question, isn’t it? Do we think that except for the relatively small number of military casualties coming back from Iraq we will be unaffected? I’m sure that’s what our “leaders” would like to promote, but that’s not the reality. Every G.I. that’s been killed, and every one of the tens of thousands who’ve been wounded — physically and mentally — has a family; has a hometown; had hopes and dreams and skills they would have shared fully with their communities and society. Instead, we will bear the financial and emotional costs of dealing with the families of those men and women and everyone their pain has touched, radiating out in ever-larger circles — for the rest of their lives. Say nothing of the opportunities lost, the health care these billions could have provided, the civil liberties we have lost, etc. etc. Just the direct costs, financial and emotional, from this war will be felt for generations. And as a people we will be much less safe when it is finally over. Look at what other countries thought of the U.S. right after September 11, 2001, and what they think of us now. We are making a dangerous world for our children and grandchildren. Ron: Despite my better judgment, I occasionally get incredibly frustrated with the failure of the antiwar movement to end this damn war. In fact, sometimes I feel like going the route of the Weather Underground. I know I am not alone in this. Indeed, I would imagine that you feel this way sometimes. What do you do to convince yourself to continue the struggle? Mike: It is most definitely frustrating, without a doubt. Is violence the answer? I can understand what drives oppressed people to it, but I still think it can never really be the answer. 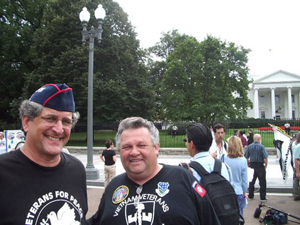 Ron: Last fall before the big antiwar march on Washington, you wrote an article calling on people to sit in around the White House a la the Chinese occupation of Tianamen Square. Do you still think this is a good strategy? Mike: Actually, my suggestion was that when we were hundreds of thousands strong, we sit down then, not two days later in a staged sit-in at the White House, which is what happened. Bless every one of those 400+ people who got arrested there (I was arrested earlier that morning at the Pentagon with 40 others), but at some point we have to take seriously the idea of putting a very large wrench into the gears of this war machine – -make the nation simply ungovernable in every way we can. We have to do more. Ron: Back to the fast — will there be a way for people to keep in touch with this campaign and publish its progress on their email lists and in their local organizations? Mike: Check out the Voices for Creative Nonviolence website for updates. MORE IMPORTANTLY, organize a fast, or a vigil, or better yet, a sit-in at your local congressional offices, and let us know what you’re doing so we can fan the flames of protest. Ron: As a vet, do you have any special message for women and men who are currently in the service (or considering joining)? Mike: If you’re thinking of joining, don’t. It ain’t worth it. And I don’t just mean you might get killed or wounded. The military is not what we should be using as a tool to protect the holdings of the empire, and that’s its basic role no matter what the enlistment commercials say. If you’re already in and have come to believe what we’re doing is wrong, call the G.I. Hotline 800-394-9544 and find out what you can do to get out. Ron: Thanks for your time. I’ll keep in touch.